I've seen this recipe on What's Gaby Cooking's site many times. I've bookmarked it, screenshotted and pinned it many times too. 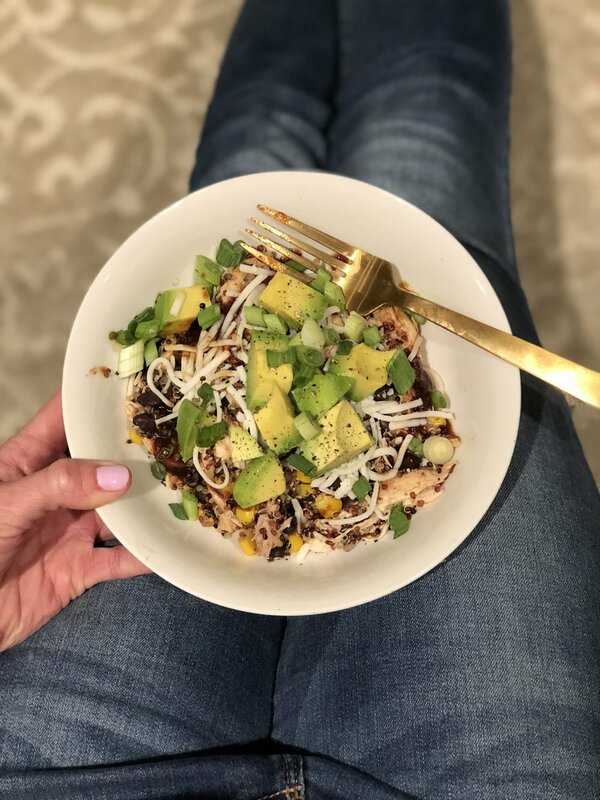 After letting it hang out in cyber space I finally cooked up Gaby's very popular BBQ Chicken Quinoa Bowls. I love BBQ sauce, so this was a home run for me. Keep reading for the deats and hopefully this convinces you to make it this week. Cook your quinoa according to package directions. In a large bowl toss together the quinoa corn, black beans and chicken. Drizzle with a 1-2 tablespoons of BBQ sauce and season with salt and pepper. Portion out mixture and top with another drizzle of BBQ sauce and a sprinkle of shredded cheese, scallions and chopped avocado. More cracked pepper too! *If meal prepping this dish to eat throughout the week.. mix the quinoa mixture then store in the fridge. Portion out each night, re-heat for 1.5 minutes in the microwave (or eat cold). Top with BBQ sauce, cheese and avocado!